Chewie is not really that potent I think. He has high endurance but besides his 1 turn taunt (only 1) he is pretty useless I think. Other (farmable) tanks are much nicer. Boba seems the pro pick for PVP because of his aoe ability block and endurance, he also hits harder. However I went for fives first and don't regret that at the moment. Geared up (easy) he is a beast, especially against aoe teams. CA procs often and has a 25% dmg boost. Daaka is a lightweight and more or less unreliable in PVP due to that (attackers will focus her down first). The 60 players stated to stay away from using her in PVP. I'm currently starring up Ashoka but her only downfall is her overall hp is the lowest in the game. Even lower than tie pilot not just hero hp. I'm currently using Ahsoka and she's worked well for me, she heals herself up really well and her HP is boosted at the beginning of battles. Plus she's hits pretty hard and survives even better on a Barriss team. 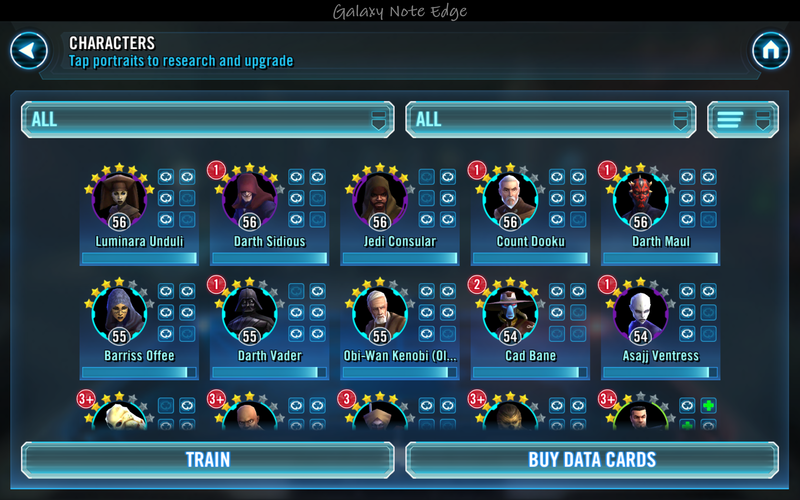 What about Consular for Simming the Cantina in the 3rd tier, plus grinding for shards? I think the general consensus is that Consular will go decently far and you get access early. Anybody know if they patched the cooldown bug that was adding 1 on ability upgrade? Luminara is consular 2.0. Also Chewbaca is the only farmable tank with a taunt thats worth it and found in cantina battles. I'm using her too lol. Both level 7 gear, both about to be five stars. And both hit well as well as heal. Consular has more health though luminara hits a little harder. You will get maximum efficiency and balanced progression using 2 Cantina refills per day. I chose Ahsoka over daka because I got her from pack, but overall considering Daka is also made of glass I would still recommend Ahsoka for her dps and leadership ability synergy. Also the game is already heading down the path of high DPS so healers are becoming less and less viable for PvP. The last hero to 7★ will be Ahsoka. With the different farming methods you could go with complete Night Sister or Jedi teams too. I have Ashoka at 4*(Still farming).. Try to focus on "Daring Padawan" ability.. That should give her a huge HP boost.. She gets a huge hp boost for each living ally which is awesome..
Once I have my mainstays starred up... 5* or higher... I'll probably farm poe to replace Chewie as my main tank. Literally same squad, same star levels. I got Daka from a Bronzium yesterday and I'm considering switching using Cantina shipments to level her up for Dark side progression (up to the super Luke Hard mission), GW which is giving me constant runs of near impossible 7 star 60 teams, and possible future Nightsister shenanigans. I'll keep running Ahsoka shard missions, only need 20 or so till 6*, plus it looks like I might replace her soon anyway. Also I'm almost 7* Ventress so will probably start farming Sidious next. I also caved and bought the Kylo Ren pack, I'll monitor it over the next few days, but Kylo, Sidious, Ventress would be a pretty powerful team I think. To the best of my knowledge moving in and around the top 10 we have the highest power squads on the table. Most of the top 25 or so seem to be using a few decently promoted chromium Heroes, like the guy in #4 has a FO Tie Pilot that takes a few hits to go down (with the speed of his healers it usually takes 2-3 turns). And he packs a whallop, can 1HKO most of my squad if he gets double shots down. I figure he must be at least 6★. Had to take him down to get #1 for todays rewards. There's 2 big spender lvl 60 guys I struggle to beat in #1 and 2#. Both with ~21k level teams. I left it to last minute today to try and snipe #3 from #12. A guy I beat 70% of the time managed to defend with a few lucky crits and stuns. Sidious's buffed AOE hurts, and I threw a heal instead of finishing of his Maul, which was a bad move as Maul AOE'd me for insane damage. He had a fairly levelled Kylo Ren, who didn't put out much damage but his healing debuff stuck which crippled me. Ahsoka and Talia stick out as the weak points in my team. I'll be weighing up my options but Kylo, Sidious, Phasma, Poe look like the possible replacements. I'm even considering a First Order setup but I'm waiting to see the consensus on the new hero viabilities. Agreed. Ahsoka and Talia are the first to be replaced which has been my intention from the start. My strategy was simply to build the fastest and most viable squad to maximise Arena shipments as quickly, and for as long as possible. I will then be upgrading my main squad the most efficient way possible with a team that can continue to snipe for #1 rewards as long as it holds my interest to do so, but ultimately Cantina and L&D farmable only characters are where the money is, so as long as chromium only Heroes do not totally overshadow farmables I'll continue to be in the best shape possible. From the basic calculations I've done I'll even be able to start farming the Arena for chromium crystals, but I'll never get enough to 7★ even one character without spending, which I wont do with the current game economy. I'm sure they will need to devalue their game currencies at some point to keep a good income. If the movies are scheduled annually for release it may be a long time though. So looks like everyone hates Ahsoka lol. I've only had her for a week and been playing for two so if I have to replace her it won't be a huge pain. So then who should I replace her with? This is what I have to work with, the top 5 are my go to. BTW I'm also a F2P that got lucky with my first pack and got Barriss but now unlucky with the nerf lol. I would bring Tie Pilot into the mix. Get you some heavy hitting done. Ahsoka will serve a purpose for you and worth maxing out with what you have, switching now will slow you down a lot as far as the Cantina Shipment Hero progression goes. I'd recommend Gyazo. Then use the image next to the smiley to post the image URL. Yea I figured sticking to what I have would be the best course, as long as I can stay in the top 50 of PvP I'll be happy.